President George Abela, who took his Oath of Office today, was born in Qormi on April 22, 1948 and is the son of a registered port worker. He was educated at the Lyceum and the University of Malta where he first obtained his Bachelor of Arts Degree in English, Maltese and History and later on his Law Degree. He furthered his studies in European Law and obtained his Magister Iuris Degree in 1995. Dr. Abela worked in private practice for 33 years and has been a practising lawyer specialising in Civil, Commercial and Industrial Law. He acted for 25 years as the legal consultant of the General Workers’ Union and represented the workers’ interests, affiliated in four separate trade unions, in the negotiations concerning the Air Malta rescue plan in 2002. He also represented port workers in the port reform of June 2007, which reform was hailed by the European Commission as a model in social dialogue to be followed by other member states. 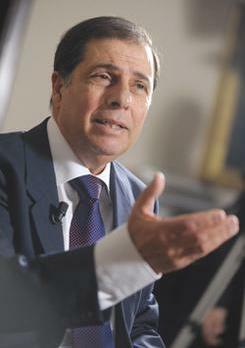 He also served as legal advisor to the Medical Association of Malta and other house unions. For many years, Dr. Abela was deeply involved in the administration of sports in Malta, particularly in football. He first served as a treasurer in his village football club, Qormi F.C., and later on as its president. In 1982, after serving as vice-president, he was elected president of the Malta Football Association, which position he held for 10 years. Dr. Abela was also involved in the Kerygma Movement, where he acted for some years as chairman for the Campaign Solidarity Through Sports, in aid of philanthropic institutions. In 1992 Dr. Abela was elected as Deputy Leader of the Labour Party in charge of party affairs. In 1996, the Malta Labour Party won the general election. Subsequently, he was appointed as the legal consultant to the Prime Minister and invited to attend cabinet meetings. He resigned the deputy leadership in 1998. Last year he was runner up in the PL leadership election. Dr. George Abela served for a number of years as director of the Central Bank of Malta and as executive director of Bank of Valletta. He was also a member of the Electoral Commission responsible for the running of the general elections in 1987. He actively participated in the Malta E.U. Steering and Action Committee (MEUSAC) in pre-accession negotiations for membership in the European Union, where he formed part of the core group focusing on the legal and social aspects of membership. After accession, he sat again on MEUSAC as the Labour Party representative. Dr. Abela is married to Margaret nee’ Cauchi and they have two children, Robert and Maria. Mrs. Margaret Abela, spouse of the President of Malta, was born in Valletta on the 14th March 1949. She received her elementary education with the Franciscan nuns at the Pilar School in Valletta, her primary education at St. Elmo Primary School and her secondary education at Maria Assumpta Secondary and Technical School in Hamrun. On completion of her formal education, Mrs. Abela started working on a full time basis in the administration department of the Old University of Malta in Valletta, and later on at Tal-Qroqq, Msida. Once married, she dedicated all her time to her family, whilst at the same time carrying out administrative work at the legal office run by her husband and subsequently also by her son, Robert. For a number of years, Mrs. Abela was socially involved in the Tarxien Parish community, where she used to give catechism lessons to children preparing for their First Holy Communion. She married Dr. George Abela on the 23rd May 1976 and they have two children, Robert who is a practising lawyer, and Maria who is a Communications graduate and specialising in “Canto Lirico” at the Conservatorio Giuseppe Verdi in Milan. Mrs. Abela’s interests vary from doing half-cross stitching tapestries to long walks.